The Orient has long shared its ancient wisdom, and so now do the Northmen. 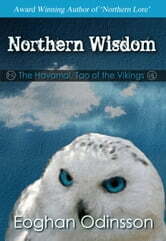 Northern Wisdom presents ancient Viking parables and knowledge in a delightfully accessible modern format. Combining Teachings on par with Buddha, Lao Tzu, Myamoto Musashi, Nicollo Machiavelli & Sun-Tzu , "The Havamal" sheds light on forgotten lore of the dark ages. In the days of the shield-wall, there still lived poets, scribes and philosophers. Packing One Book? Look no further.